The rubber ring was dry-rotting and not doing its job. I ordered a new one along with the inner aluminum sleeve (less than a $5 investment). Disassembly is easy with a T40. Yep, the rubber ring was shot! The ball-joint was bone dry as well. I added a smear of grease with moly and worked it in. Reassembled the business with a little blue loctite on the screw and 19nm torque. Good as new. Re: Steering damper droop. Easy fix. On the steering damper - the other thing to check while it's off is for any free play. ANY free play/movement as it starts moving indicates a bad steering damper. It may not seem like much play - but it only takes a tiny bit to result in 1-2" of undamped motion on the tire/rim. This won't cause wobble, but it will cause a strange loose feeling on de-acceleration, and GREATLY increased sensitivity to side winds and turbulent wind off truck or roadside structures. BTDT at about 85,000 miles on my former '07 R1200R - ended up getting it changed out in Kansas City in the tail end of a coast-2-coast-2-coast ride. It made a huge difference in confidence in the bike on the long straight roads of the midwest. You won't really feel this going - like shocks going bad - it's something that happens so gradually that you "adjust" to it. 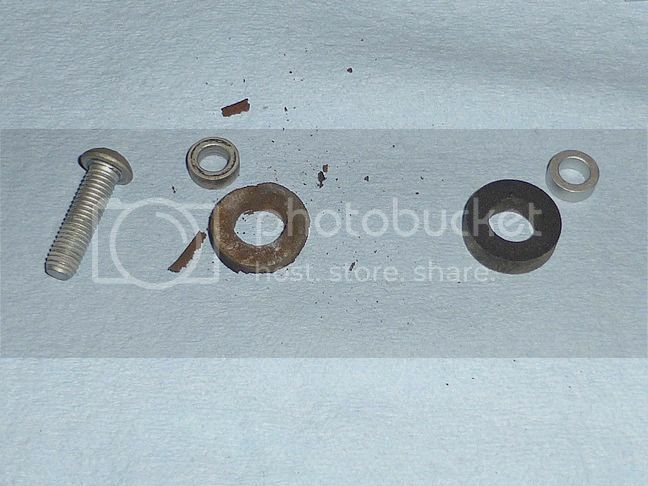 What finally clued me in was the nasty sensitivity to wind, combined with a little tiny drop of oil I found on the rear end of the steering damper shaft. $500 later - it was all better. BTW - if you didn't use blue-locktite on the screw - it's worth doing. It's not one you want coming out, and it's not one you can normally see. 2012 R1200R - I love this bike! Gotcha. The post that came along sometime ago detailing the shift-linkage disassembly and lube prompted me to do it. Those rubber rings were long gone and got replaced. I checked it and it seems to dampen through a full range of motion. Funny you mention this, my steering must have slowly deteriorated over time because I took her out for about a 150 mile ride yesterday (very windy) and the front end was very tight and stable again. I must have just adjusted as you described. Sure did! Paid attention to the torque too. Last edited by R12RnHouston on Mon Dec 07, 2015 2:15 pm, edited 1 time in total. R12RnHouston wrote: I checked it and it seems to dampen through a full range of motion. So did my bad one. The mechanic at Engles Motors showed me how to check it. Where you feel the "free-motion" (no resistance/damping) is a very very narrow range right as it starts moving, no matter where it is. As oil leaks out - a small air-filled void forms, centered around the "piston" (really more a disk type wafer with holes in it). The void will be on both sides of the piston when the damper isn't moving. It will allow free movement until the disk touches the fluid on either side of it. As the entire piston moves - the void moves along with it. The damper will feel just fine if given a long stroke in either direction. Lots of resistance to movement - but what you miss is the initial free-play caused by the void. To really feel for it - you need to pump the damper about 1/4" - in/out/in/out - it then becomes pretty obvious. The clue to look for this - any fluid around the seal on either end. ANY. It was only a tiny drip on mine that clued me in. If there is any sort of oily deposit on the damper shaft - it's worth removing and checking. It looks as if it would be trivial to rebuild one of these dampers if you can find the seals and the shaft isn't scored or damaged. Just remove the seals, clean up the parts, replace the seal at one end, and fill with oil at the other end (pointed up) until it overflows, then let it sit for all the air to get out. Finally push in the other seal (oil will come out around the sealing lip - but cause no damage) - then replace the snap-ring holding it in. If I hadn't been in the middle of a trip when I realized mine failed I probably would have explored that possibility. I'll check it when I get home from work this evening (and hope for the best). Hard to say. There is no fluid on either end, and no discernible play as you described. I think removing the wobble by replacing the dry rotted ring accounts for the improved feel. Of course that could be placebo. I always thought if I had to replace the steering damper I'd go with Hyperpro to match my shocks. R12RnHouston wrote: Hard to say. There is no fluid on either end, and no discernible play as you described. I think removing the wobble by replacing the dry rotted ring accounts for the improved feel. Of course that could be placebo. I always thought if I had to replace the steering damper I'd go with Hyperpro to match my shocks. Given the price BMW gets for the very simple stock one - that would have been my choice too if Klaus could have gotten it to me quickly enough. It would have taken several days to get it from Klaus (EPM Performance) - and I could by paying a silly $$$ - get it overnight from BMW. On the road makes a difference.. doing it at your leisure would certainly be the way to go. Thanks for the tips! I checked mine and I have tons of freepaly through the rubber ring. Mine was in better shape from your photos, but its no longer holding the damper firm. I'm storing my brother's bike, (I think a 2012?) So I had something to compare mine too. It definitely wobbled back and forth quite a bit. I would never have checked that but for this post. Appreciate the info. 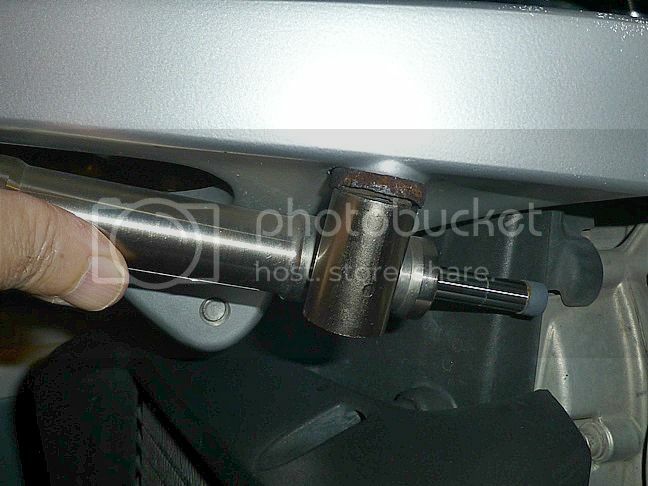 I need to replace the damper on my '07. 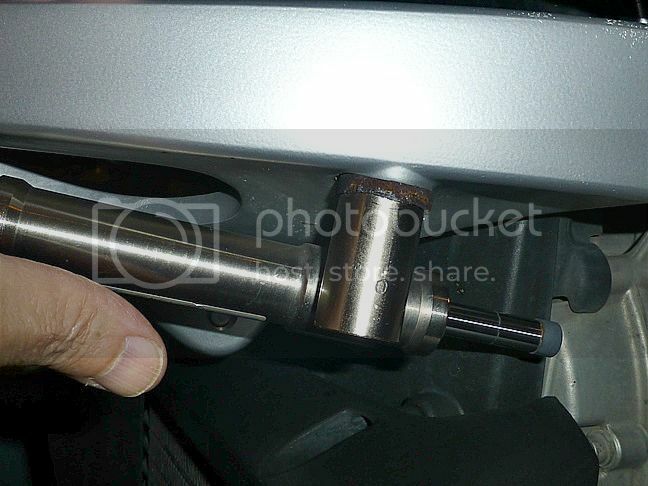 Is it as simple as it looks, attach it via the nut to the steering head and the screw in the cylindrical part? I will also replace the rubbery ring. 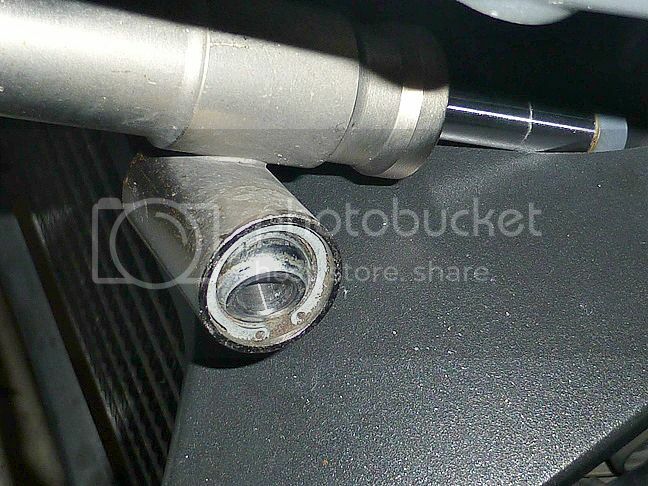 vroomr wrote: I need to replace the damper on my '07. 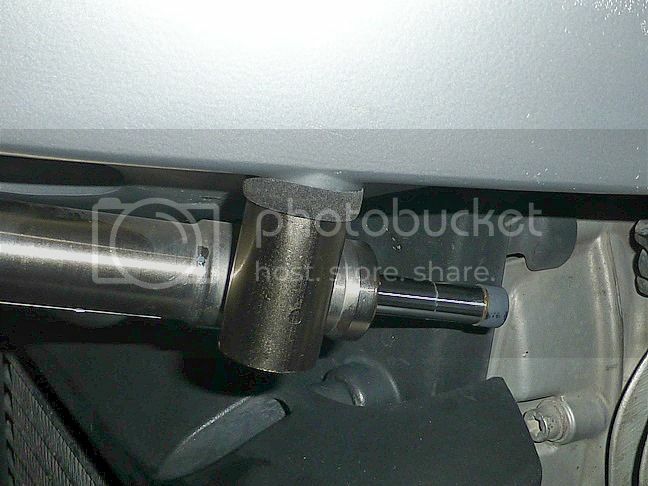 Is it as simple as it looks, attach it via the nut to the steering head and the screw in the cylindrical part? I will also replace the rubbery ring. It is as long as you reuse the front ball-mount. The ball on the front ball mount is on a bolt that goes through the front fork-bridge and has a nut on the other side. To get to that nut you have to take off the fender. To take off the fender you have to remove the front wheel. As long as the front ball joint is still good - it's fine to reuse it with the shaft from the new damper. The new damper does come with the ball joint and the stud-ball.. you can put them in your box of miscellaneous R1200R parts. I had it done by my indie today, and it was as you describe, remove wheel and fender. Wow, was that glorified shock absorber expensive!